Everyone knows Mr Kipling makes exceedingly good cakes, now in a team up with Casdon they have an exceedingly good children's toy. 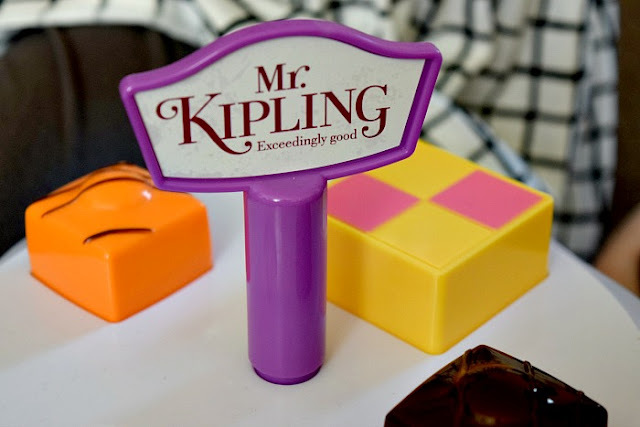 We were sent this Mr Kipling Cake Stand by Casdon for the kids to review. The excitement when they saw it was indescribable. The two-tier cake stand includes 10 classic, and realistic looking, Mr Kipling cakes. Including, French Fancies, Battenberg, Angel Slice, Jam Tart, Cherry Bakewell and some kind of pie. Each cake has a little shape indent underneath which corresponds with it's place on the cake stand. This gives children a little extra something to do with the cake stand. Even Elsie at 21 months had fun trying to find the right place to put the cakes. My kids have a toy kitchen which they play with almost every day. They love to use their imagination when it comes to playing and had so much fun with this set. They used it as part of a tea party, set up a bakery where they bought and sold cakes to each other and even tried feeding them to all the grown ups. The amount of fun created with this toy was brilliant. I was so surprised to find that it actually only costs £10. I thought with it being the product of two great brands and a great novelty item that it would be in the £15-20 area so was pleasantly surprised. 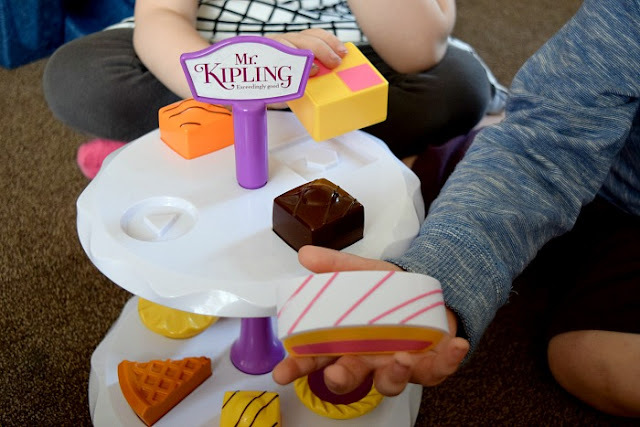 You can see the Mr Kipling Cake Stand in action in our Youtube video which features all three kids enjoying it in their own way and a look at the shape sorting features. You can buy the Casdon Mr Kipling Cake Stand from Amazon. Haha I think that every time I see it! Aah my boys would love this!! They're a little bit old perhaps for the shape sorting but they're OBSESSED with cooking in their little kitchen and often use lego bricks for pretend cake!! What a lovely toy! that is so cute! I'm sure my toddler would love it as cake is such a familiar sight in my house. Haha glad I am not the only one with a cake obsessed house! It is so cool and she would love it!